Countries facing depletion of their fisheries by foreign vessels have been thrown a lifeline, with an international tribunal ruling that countries can be held liable for not taking necessary measures to prevent illegal, unreported or unregulated fishing operations by their vessels in the waters of other countries. Gland, Switzerland: Countries facing depletion of their fisheries by foreign vessels have been thrown a lifeline, with an international tribunal ruling that countries can be held liable for not taking necessary measures to prevent illegal, unreported or unregulated fishing operations by their vessels in the waters of other countries. 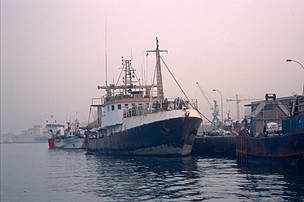 The ruling is included in an advisory opinion issued today by the International Tribunal for the Law of the Sea (ITLOS)on the application of the West African Sub Regional Fisheries Commission (SRFC) – comprised of Cape Verde, The Gambia, Guinea-Bissau, Mauritania, Senegal and Sierra Leone. "No longer will we have to try to combat illegal fishing on a boat by boat basis"
WWF, which has long sought clearer definition of flag state obligations for vessels, supported the action and filed two amicus curiae (friend of the tribunal) briefs during the deliberations. The advisory opinion stated that countries have a duty of due diligence to ensure that their fishing vessels do not engage in illegal, unreported and unregulated (IUU) fishing in the waters of other countries and can be held liable for breach of this duty. The advisory also holds that the European Union can have the same due diligence duty as a flag state, when they are the party to fisheries access agreements with other states. Illegal, unreported and unregulated fishing in coastal waters costs the world between US$10-20 billion annually, undermines fisheries management and robs coastal communities of food and livelihoods. West African waters are believed to have the highest levels of IUU fishing in the world, representing up to 37 per cent of the region’s catch. The due diligence obligation means that flag states will have to take enforcement actions to ensure their vessels comply with the laws of SRFC member states and take measures necessary to ensure that their vessels comply with protection and preservation measures adopted by the SRFC member states. The tribunal also strengthened the obligations of neighbouring coastal states to each other, stating that "The conservation and development of shared stocks in the exclusive economic zone of an SRFC member state require from that state effective measures aimed at preventing over-exploitation of such stocks that could undermine their sustainable exploitation and the interests of neighbouring member states." WWF will hold a workshop in Dakar, Senegal, in June to explore what the rulings can offer to coastal states in protecting fisheries and livelihoods.